What Aquarium Maintenance Will Ensure a Healthy Aquarium? 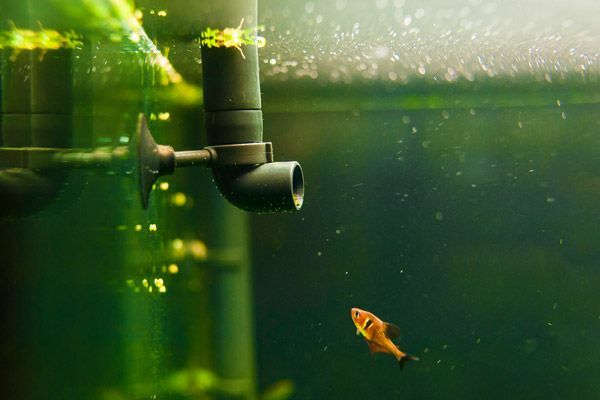 Follow This Aquarium Maintenance Guide for a Healthy Home Fish Tank! Aquarium maintenance is a lot of work. To keep your aquarium healthy, you need to monitor many water parameters and care for your livestock every day. On top of that, you also need to maintain your equipment and keep on the lookout for algae and disease. Sometimes aquarium maintenance might seem like an unending laundry list of tasks. But Living Art Aquatics is here to provide an essential guide to aquarium care. In this post, we focus primarily on water quality and fish health. 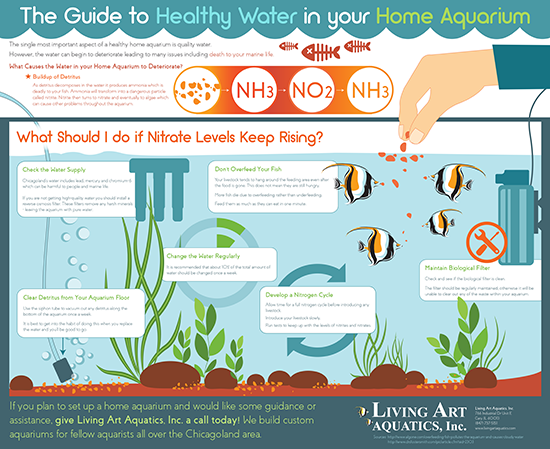 So, read on to learn everything you need to know about maintaining your home aquarium! Keeping up with routine aquarium maintenance is essential to the health of your fish. How Do You Cycle an Aquarium? Cycling your aquarium is a crucial first step in saltwater and freshwater aquarium maintenance. Before you even add any fish to your tank, you need to establish a nitrogen cycle. During this process, unhealthy water elements break down to nurture good bacteria needed for your tank’s survival. The cycle consists of fish food rich in protein getting eaten and digested, then expelled as ammonia-rich waste. Good nitrifying bacteria convert that ammonia into nitrites and then nitrate, which steadily accumulates until removed in water changes. You should start this cycle by letting your aquarium run for at least a day without any fish. Use a cycling aid to seed the aquarium with good bacteria. Then, introduce a couple of only your hardiest fish, like gouramis or danios. Add no more than three per week. Be careful not to overfeed or overcrowd, and ammonia levels should remain at safe levels. But you should still test the water frequently and remove harmful elements when they become too concentrated. Amateurs sometimes try to skip this step or take shortcuts using ammonia-neutralizing supplements that leave the bacteria without anything to eat. But if you take the time to do it right, you’ll save yourself an uphill battle in the future. Monitoring water parameters is paramount to good aquarium maintenance. We can’t stress enough how important it is to test the parameters of your water every week. This testing is the bedrock of good aquarium maintenance. Invest in water testing kits and learn to perform these tests regularly. Depending on what species you keep in your aquarium, your water’s pH should remain between 6.5 and 8.2. More importantly, your pH levels should remain stable. Raising pH will make chemicals like ammonia more toxic, and rapid changes to pH can kill lots of fish. Low alkalinity can trigger rapid pH shifts and severely impact livestock health. Keep alkalinity in the range of 120-300 mg/L to help maintain stable pH levels. Water hardness is another factor that affects pH. Hard water increases it, and soft water decreases it. Keep water hardness in the moderate range of 100-250 mg/L to make it easier to maintain your pH. Your city adds these chemicals to your water to make it safe for humans to drink, but they’re deadly to fish. Make sure to put your aquarium water through a de-chlorinator and test for these chemicals regularly to make sure they’re not present in your tank. These relate to the nitrogen cycle you’ve established. You don’t want these building up too much in your aquarium, or they’ll cause trouble. Test your water weekly and perform a water change, as we describe next. If you have a saltwater aquarium, you’ll additionally have to monitor the salinity of the water in your tank. Research the preferred levels of your different fish and aim for the happy medium between them. But remember that you must balance this against the other parameters as well. How to Perform a Water Change. Water changes are an essential component of effective aquarium maintenance. During your water testing, you should perform a weekly 10% replacement of the aquarium’s water with fresh dechlorinated water. Additionally, you should perform a monthly 25% water change and vacuum the gravel at the bottom of the tank. You should also scrub for algae, prune live plants, clean plastic decorations, and replace your pump’s air stone. But be careful of going overboard with your water changes. Remember that sharp changes in the environment can do more harm than good for your fishes’ health. There are many types of water filtration systems on the market. 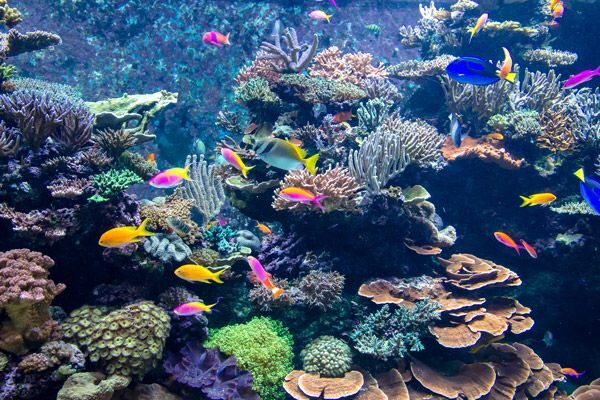 An equally important aspect to aquarium maintenance is keeping your filtration equipment in working order. Otherwise, all that tweaking with the water parameters is for nothing. A complete filtration system uses mechanical, biological, and chemical filtration to remove debris as well as ammonia and nitrites. There are a lot of different setups available, including canister filters, undergravel filters, and power filters. 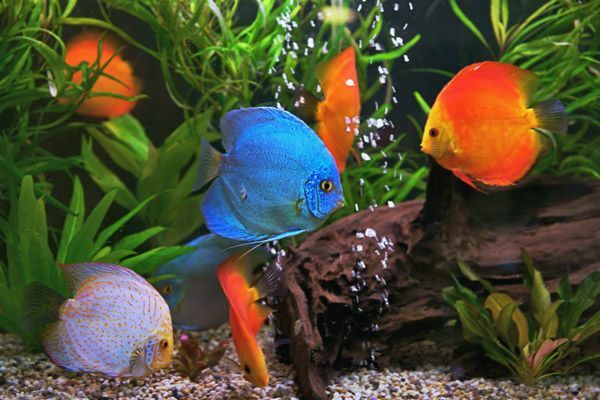 Choose the one that best suits your aquarium so it can protect your fishes’ health. But to keep it working correctly, you should perform monthly maintenance on your filtration system. Rinse the pre-filter, replace the carbon and filter cartridge, and do any other tasks specific to your filtration system. Don’t Over-Clean or Under-Clean Your Tank. While cleaning your tank is a vital part of aquarium maintenance, it’s essential to find the right balance. The perils of under-cleaning your tank are manifold. If you neglect water changes and cleaning, you might miss important signs that your tank is in danger. Use a siphon tube to vacuum detritus along the bottom of your aquarium once a week during your water changes. At the same time, it’s equally important not to go overboard with the cleaning. If you try to clean too thoroughly, you might scrub away the good algae necessary to keep the nitrogen cycle going. Also, you don’t want to use any cleaning products like soaps or detergents when cleaning aquarium components. These are harmful to fish and shouldn’t be used for aquarium maintenance. A basic rule of aquarium maintenance is to quarantine new additions in a separate tank for at least two weeks. This initial separation lets you monitor them for signs of disease before introducing them to your tank community. This also has the added benefit of giving the new fish an additional stage in their transition into your aquarium. It makes the process less stressful for them and improves their chances of survival. Don’t Stock Fish that Don’t Belong Together. While it might go without saying, not all fish can live together in harmony. And managing their competing needs and personalities is one of the most challenging aspects of aquarium maintenance. Don’t set yourself up for failure by pairing inhabitants that aren’t compatible. Sometimes, this is because they have different needs regarding aquarium conditions and water parameters. 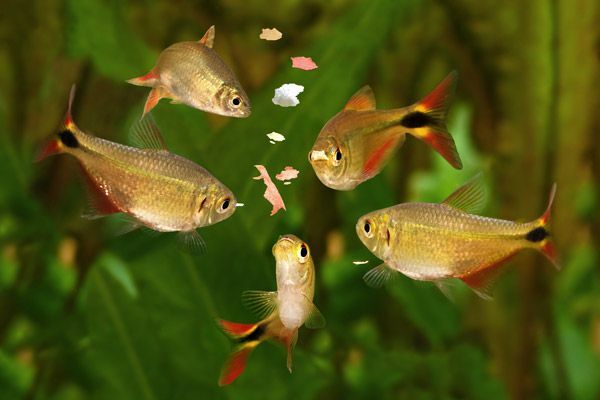 Other times, some fish have behavioral conflicts and might bully, fight, kill, or even eat one another. For example, tiger barbs and other fin-nippers don’t belong in an aquarium with long-finned fish. Research every species you’re thinking about adding to your aquarium before you follow through. Make sure that they’ll fit into the water conditions and social environment. Otherwise, save them for your next aquarium. Maintaining a nutritious diet is crucial to fish health. Feeding your fish is the most obvious and fundamental task of aquarium maintenance. That’s why it’s so important that you get it right. You must choose the right foods and set a schedule that doesn’t overfeed or underfeed your inhabitants. But there’s more to this than merely considering herbivores and carnivores. Your feeding schedule must also accommodate fish that eat in different parts of the tank, in varying amounts, at different times. For example, if you’re only adding flakes, then the fish that feed at the top of the tank might become overfed. Likewise, the bottom feeders might remain underfed. Many fish also want variety in their diets. Exclusively feeding them one food type can hurt their health. So, you must develop a rhythm for changing up their diet with frozen foods and other treats. You should also be very careful not to overfeed. Amateurs often see livestock lingering around the feeding area after the food is gone. Mistakenly, they take this as a sign that they’re still hungry and need more food. Don’t fall for it! Believe it or not, more fish die because of overfeeding than underfeeding. So, try not to feed them more than what they can eat in one minute. Maintain Proper Heat and Light Levels. Temperature and light levels also impact fish health. So, keeping these consistent is another critical step in ensuring proper aquarium maintenance. The initial setup of your aquarium should include installing an aquarium heater that keeps temperatures stable in the range of 74-82ºF (23-28º C). The species you stock your aquarium with will likely have more specific temperatures best suited for them. Research these and make sure to check the water temperature daily. Lighting is similarly important. Different organisms need different light levels at various points throughout the day. Again, make sure your inhabitants are compatible before you pair lowlight species with ones that love lots of light. Recognize the Signs of Disease. As previously mentioned, you should learn to spot signs of parasites and disease during your new fishes’ quarantine period. But you should also do the same once they’ve become part of the community. From bacterial infections to parasites to deadly algae, there are many different threats to the health of your livestock. The full list of all the diseases out there is extensive and overwhelming for a novice aquarist. But you should familiarize yourself with the symptoms of some of the most common illnesses, so you catch them early. There’s an endless number of things that can go wrong in your aquarium and threaten the health of your aquatic friends. That’s why it’s good always to have an expert on call. Living Art Aquatics has been designing custom aquariums and performing aquarium maintenance in Crystal Lake, IL and the greater Chicago area for decades. We’d love to hear about your aquarium and work with you to resolve any issues you might have. Give us a call at (847) 737-5151 to set up an appointment today!